A lot has been written about Meerkat vs Periscope so far, but most posts have relied on cursory data and anecdotes. Given Keyhole’s focus on social media tracking, we thought we’d take a deep dive on the data we’re able to capture, and find signals that tell the true story behind Meerkat and Periscope. Specifically, we wanted to look beyond just the number of tweets with Meerkat and Periscope videos because these aren’t very telling — they are trailing metrics. We analyzed over 320,000 Meerkat and Periscope videos shared on Twitter between April 1-8, 2015, and here’s what we found. Looking at the number of videos shared from each platform on Twitter, it would seem that Meerkat and Periscope are close. But these graphs don’t tell the full story — they’re trailing metrics. What’s more important is an analysis of who is using each platform and how engaged these users are. The higher the engagement, the higher the likelihood that the platform will continue to thrive. Although the 2 platforms look close, only one has been able to drive higher engagement and secure a more influential user base. One related fact: less than half of Periscope broadcasts are tweeted out (users have the choice to toggle). Arguably, the metric that matters most to all apps is user engagement — how often does a user feel compelled to use the app and how often do they return? In many cases, this metric alone may be able to predict the survival and growth for a new app. So how did the two apps perform in this area? 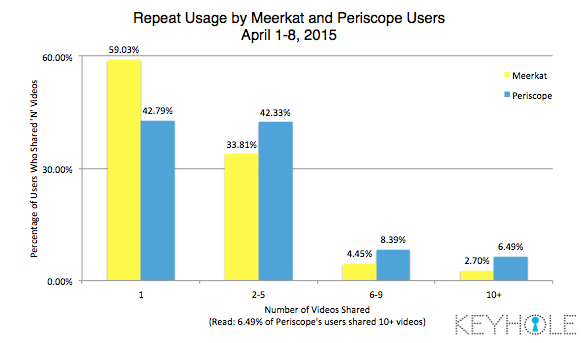 To determine this, we looked at frequency of usage by Meerkat’s and Periscope’s users during the 8-day period. If a large percentage of users shared only 1 video, it was taken as a more negative signal than if users shared videos more frequently. It’s easy to argue that Twitter’s support has helped Periscope obtain users, but this doesn’t alone why it has thrived. As the chart above shows, we found that the majority of Meerkat’s users were one-time sharers, while the majority of Periscope’s users were repeat users. In short, people are trying both platforms, but they’re returning to Periscope at a much higher rate. In total, 59% of Meerkat’s users shared only 1 video while 41% shared 2+ videos. On the other hand, 57% of Periscope’s users shared multiple videos (39% more than Meerkat). Almost 6.5% of Periscope’s users shared 10 or more videos! How ‘Influential’ are Each Platform’s Users? Influence is always a touchy topic since it can be defined in so many ways, but there’s no doubt that it drives distribution and large consumer adoption. For our report, we looked at influencer in the most simple of ways — by number of followers. Although this can be ‘gamed’, getting to 10k+ followers isn’t easy, and so the data would be directionally correct. So how many and what % of each platform’s users have more than 10,000 Twitter followers? It’s clear to see that Periscope has many more users with > 10k Twitter followers. 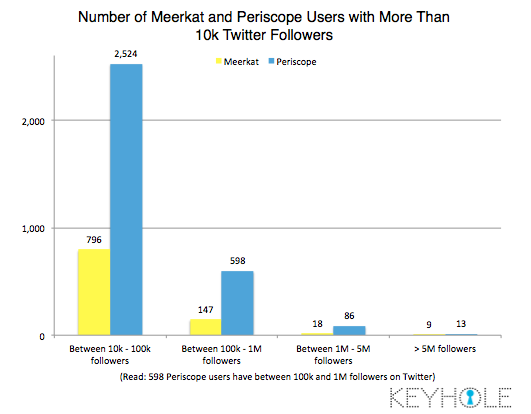 In total, 3,221 Periscope users had more than 10,000 followers, while only 970 Meerkat users did — a difference of 3X! But we’ve already seen that Periscope has more users than Meerkat, so it could be argued that more influencers is just a byproduct of that. What about on a percentage basis? Discounting the higher user base numbers for Periscope, the difference in influencers doesn’t change much. As the chart shows, Periscope has many more users with more than 10,000 Twitter followers, even on a percentage basis. In all, about 8.86% of Periscope’s users had 10,000+ followers, while only 3.62% of Meerkat’s did. 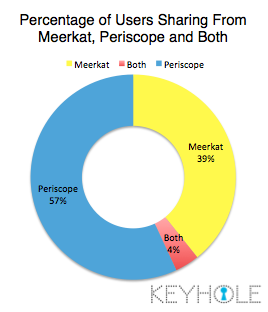 What % of People Use Meerkat vs Periscope? Let’s see if this has had an impact on general consumer usage yet. 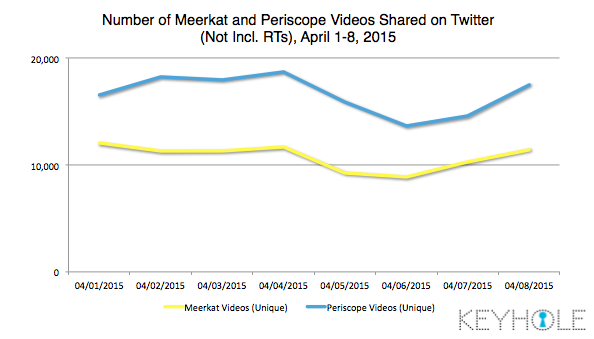 Many have argued that Meerkat vs Periscope isn’t a zero-sum game — i.e. there could be more than just a single winner in the battle of live streaming apps. But that may only be true if the two apps can differentiate themselves. As recently as last week, Meerkat’s founder argued that both they and Periscope can coexist because these apps are different. If this is indeed the case, then one would expect that people would be using both apps for different use cases. Is this what we found? Yik Yak and Snapchat coexist because they’re different in the minds of users. But so far, it looks like users are picking one network or the other. 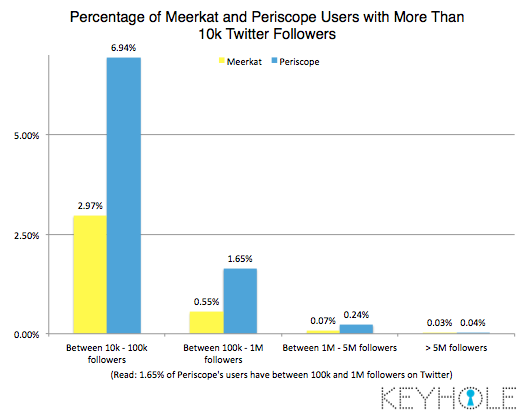 We found that 57% of users picked Periscope and 39% picked Meerkat. Only 4% of users overlapped, indicating that in the minds of users they’re directly competitive. Although a cursory look at Meerkat and Periscope usage may imply that the 2 apps are running close, a deeper look at usage data shows something different. Looking at the user base of each platform shows that Periscope has been able to leverage Twitter’s might in finding broader distribution and engaging a much larger number of influencers. But Periscope isn’t winning just because of Twitter’s support. Twitter’s support might help Periscope get on people’s radar, but only a truly good app would be able to drive repeat engagement. It’s the last chart above that proves to be most important — people are trying both platforms, but they’re returning to Periscope at a much higher rate. This engagement and repeat usage may help Periscope win in the long run. Once again, if you’re interested, here are our real-time trackers for Meerkat and Periscope.